We all have our favorite foods. The ones we must always have in our pantry or fridge. Believe me, I have a lot! But there are a few that I always have, no matter what. We all know how important eating whole grains are. I have been cooking large batches of brown rice in a water / low sodium vegetable broth mixture, keeping it in the fridge and warming it up on a daily basis. 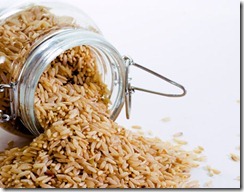 Brown rice is a complex carbohydrate that provides 15 essential nutrients, including B-vitamins, niacin and potassium. It has a low glycemic index (GI), like raw vegetables and fruits, which reduces sugar spikes in our bodies. Why is this important? High glycemic foods break down quickly and act like sugar, giving a spike of insulin in our bodies. These spikes cause weight gain, sugar cravings and could eventually cause diabetes. I love eating brown rice with roasted or steamed vegetables – a simple, yet satisfying meal. Avocado’s have been given a bad name by some for their fat content. But this is why avocados are so healthy for us! 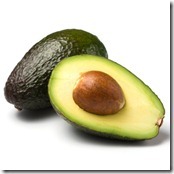 They contain large amounts of monounsaturated fat which is “the good fat” for humans, especially for women. They also reduce LDL cholesterol, which is the harmful kind, and increase HDL, good cholesterol. Their creamy texture and delicious taste pairs well with so many items! Eat them sliced, diced or smashed! I toss them in my salads, top my eggs with them, smash them on veggie sandwiches and enjoy them plain. No wonder beans are named the Magical Fruit. They have a high amount of soluble fiber making this an ideal staple food for those that do not eat meat. They also deliver B vitamins such as folic acid, and minerals such as magnesium, potassium, calcium and iron – very important for pregnant and nursing women. They are used for meat substitutes, dips, milks, as a binder in recipes and even desserts! Looking for a great vegan veggie burger? Try my Bean Burgers! Nuts are a great source of fiber, Omega fats and over all a perfect food. High in vitamins and nutrients, nuts pack a full punch of sustainable energy and nutrition. Walnuts are known to have the highest amount of good fat, omega 3’s. I buy raw nuts in bulk – almonds, cashews, pine nuts, pecans and walnuts. But because nuts are tightly packed with nutrients and fat, they are still calorie loaded you only need a small amount to benefit from their nutrients. Go with a handful or about a 1/4 cup. But be careful of pre-packaged nuts as they can have a high amount of sodium. Try them in salads, oatmeal, pancakes, baked goods, cereal, granola, with steamed or roasted vegetables… the ideas are endless! Or simply have a handful with a piece of fruit for a snack that will curb the mid-day munchies. See how simple it is to make your own Almond Milk, or try my delicious Cashew Cheese Spread. Spinach, kale, mustard greens, chard, broccoli … any green plant is a must have in my diet! Dark green leafy vegetables are, calorie for calorie, perhaps the most concentrated source of nutrition of any food. They are a rich source of minerals (including iron, calcium, potassium, and magnesium) and vitamins, including vitamins K, C, E, and many of the B vitamins. They also provide a variety of phytonutrients including beta-carotene, lutein, and zeaxanthin, which protect our cells from damage and our eyes from age-related problems, among many other effects. Plus they taste great and versatile. Steamed, cooked in soups and stews, blended and roasted. Americans do not incorporate enough greens in their diet, besides iceberg lettuce (which has near to zero nutrients). Greens need to be part of our daily diets as they contain so many of the essential nutrients our body depends on. Our health is based on nutrition – we are what we eat. Be conscious about what you are feeding your body. Eat a variety of plant based foods, limiting your intake of processed foods and un-natural ingredients. Mother Earth created plants for a reason. Enjoy them! This entry was posted in food, health, nutrition. Bookmark the permalink.